The Construction Costs Index posted a 0.2% decrease in the Basque Country in October 2009 with respect to the previous month, which meant that the year-on-year rate for that month fell by 1.1%, according to EUSTAT data. 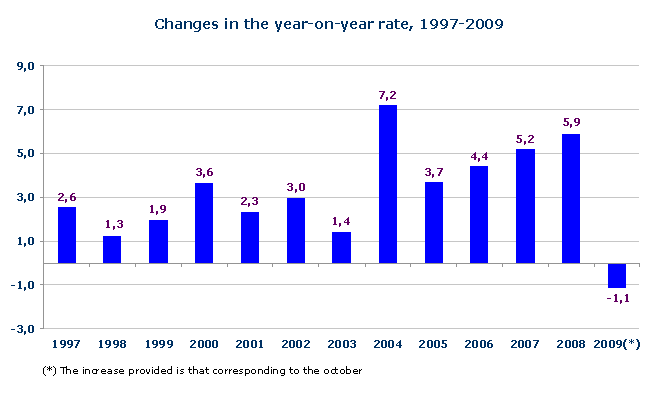 In October 2009, labour costs remained unchanged (0.0%), whereas raw material costs fell by 0.2%, compared to the previous month. The cost of raw materials fell by 2.1% and labour costs were up by 2.4% in year-on-year terms. However, the cost of the raw materials of Building and Civil Works sub-sectors performed differently in quarter-on-quarter terms. Building posted a 0.3% decrease on the previous month and Civil Works raw materials rose by 0.1%. There were also differences in the annual evolution of these two sub-sectors, although negative rates were registered in both cases: Building raw material costs fell by 1.4%, whereas those for Civil Works accumulated a 4.6% decrease. The largest decreases in the prices of the raw materials used by the sector over the last twelve months included Metallurgy (-23.5%), Electricity and Gas (-15.6%), Oil By-products (-14.1%) and the Timber Industry (-5.6%). On the other hand, the greatest rates of inflation in their annual prices (October 2009 on October 2008) were registered by the raw materials of Water (7.4%), Non-metal Minerals (2.1%), Furniture Manufacturing (1.9%) and Non-metal Industry (1.4%).